It may appear to some like the Rag Doll Panel was a design I created specifically for this fabric collection, but those of you who have been following my company from its inception (and those who have pattern tested for me) know that these girls have been around for a looooong while... just biding their time and waiting for the right moment to come out and play! 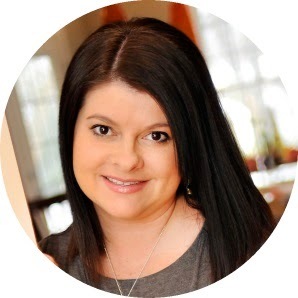 Way back in October of 2008 we decided to create a sewing pattern company at the request of about a bazillion people that saw us at the Fall Quilt Market in Houston that year. Since my background is in marketing and branding, of course I couldn't even begin drafting pattern designs without a full set of brand standards for our company. The logo was a no-brainer — I just used the same one I had been using all along for my custom boutique business (nothing better than brand equity). A set of standard fonts and colors for my marketing materials followed as well as style sheets. Next, I wanted to create a certain "look" for my mechanical drawings... something that was mod with a little touch of whimsy. My first attempt was a lot more "mod" than "whimsical" and I was feeling a tad frustrated. In February of 2009 I decided to go public and ask my dear blog readers for assistance and opinions and I'm so glad I did. My first attempt was coined "potty girls" by a sweet reader after I mentioned that Jon said they looked too much like public restroom signs. LOL! Another reader suggested adding pigtails to make them more girlie and another suggested a set of hairbows (a little nod to my old boutique days). 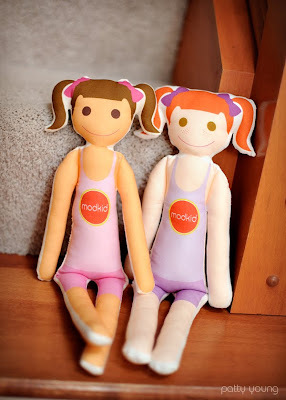 But my dear Potty Girls (which had now become sort of like the MODKID Mascot) still needed a face and as they started taking on a personality of their own I started dreaming of giving them life... a tangible, 3-D Potty Girl. I made several muslin prototypes last year until I was happy with the shape and size. But, before I even showed it to Michael Miller Fabrics, I needed to make sure they "worked" so I printed a test panel at Spoonflower. The girls looked great flat but it turned out when those broad, straight shoulders that give them the "mod" look are stuffed and curved, the girls looked more like quarterbacks than sweet little girls. Eeeek! (so glad I tested it!). A few trips back to the drawing board and a few more prototypes followed until I got the perfect Potty Girl. The original doll panel design I sent to MMF actually included 4 dolls, front & back on a 1-yard length, but after talking to Kathy, she explained that I needed to make the panel 24" (not 36") because that was the maximum repeat the mill could handle. I could only fit 3 dolls, front & back, on that 24" panel so we ended up sacrificing the redheaded one... and believe me when I tell you how strongly I struggled with that decision, since she was modeled after my dear Sophie. 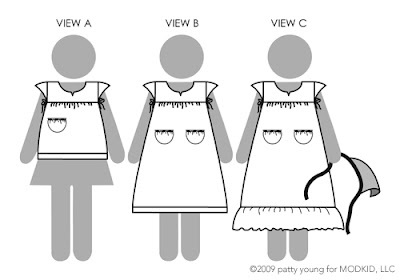 Now, I promised I would post a downloadable template for the simple A-Line dresses my Potty Girls donned at Quilt Market, so here it is. This template will fit on a standard letter-sized paper and it includes a 1/4" seam allowance. Click HERE to download the high-res PDF version. NOTE: Use only stretch fabrics or you won't be able to get the dress on your dolly. Trace the template twice onto a piece of knit fabric (max stretch going side-to-side) and cut. Stitch a narrow hem along the arm holes and neck opening on both pieces. Use your fingers to carefully stretch the fabric as you bend it along the curved edges. You can do this with a stretch stitch or a tiny, narrow zig-zag on your sewing machine. Hem both dress pieces separately, again using a stretch stitch or a tiny, narrow zig-zag on your sewing machine. Place both dress pieces right sides together and stitch or serge across the top of the shoulders and down both sides of the dress. Hope you enjoyed this trip down memory lane. Please share your Playdate creations in my Flickr group. YAY!!!! I have the whole line in my store now!!!! 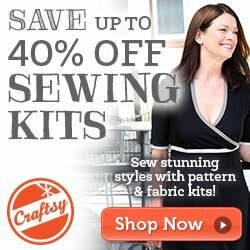 And for Memorial Day weekend use the code PLAY for 15% ANY of Patty's fabrics or patterns!!! Fun stuff! I feel so "in" having been here (meaning reading your blog) when you first came up with the "potty girls". But it does not seem like it could have been so long ago. You have really advanced quickly. I wish you, John, and the potty girls many more awesome adventures! Melanie, thanks so much for your support... always! You are a great friend! You never cease to amaze me! Great job and I loved how you chronicled the entire process. Love them!!! And while I can't wait to get them, sew them up, and I know they will be well loved at our house...as a mommy to a little red-head, I'm sad that she didn't make the cut, too. You always come up with the cutest, kid-friendly, fun stuff!!! Keep it up! Them girls are selling like hotcakes!! I'm thinking a new potty girl panel with each collection would be just too cool.... we want the redhead, we want the redhead, we want the redhead!!!!!! I've already made 2 of the 3 dolls and several dresses! Thanks so much, i love them and my daughter will, too! 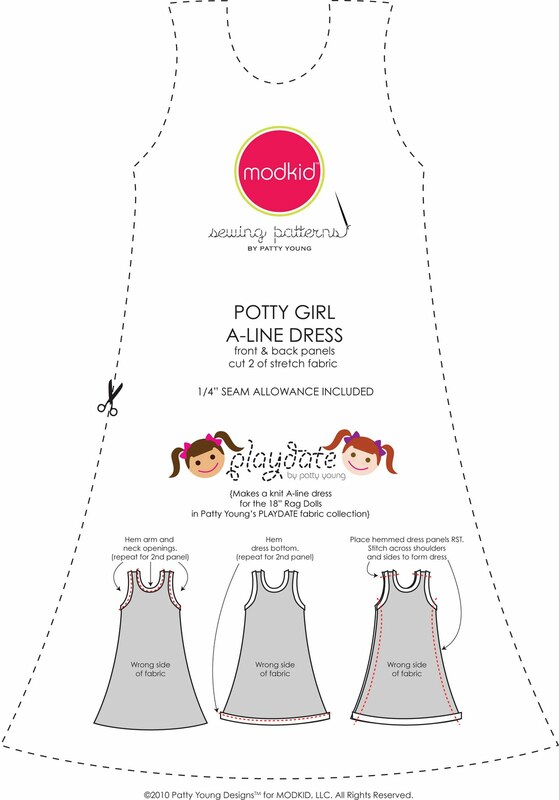 Are you going to make any other "patterns" for the potty doll dresses? Pleaaaase! We'd LOVE that!! Can you send me a link to an actual place I can order these doll panels from??? Please!